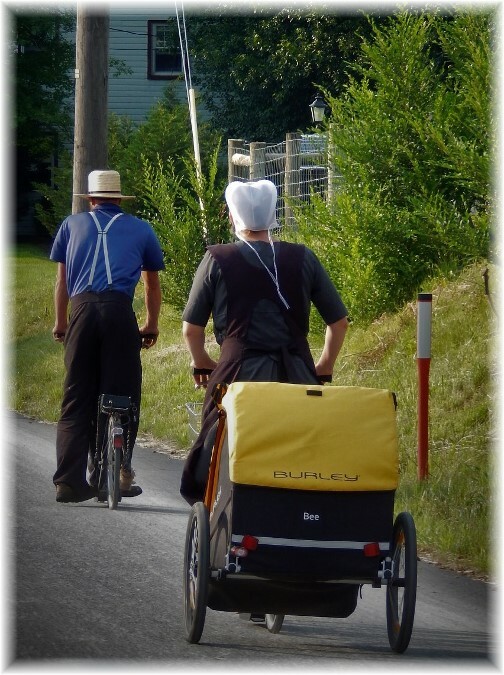 Last Saturday afternoon we passed this young Amish couple riding their scooters along Hartman Bridge Road pulling their baby in the bike cart. Message summary: Today, "all over the world this gospel is bearing fruit and growing". Members of our spiritual family are spreading the Gospel and planting spiritual seeds all over the world. "All over the world this gospel is bearing fruit and growing, just as it has been doing among you since the day you heard it and understood God's grace in all its truth" (Colossians 1:6). 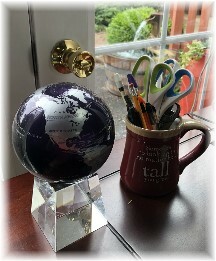 A small solar-powered globe sits on my desk, a gift Brooksyne gave me for our 40th wedding anniversary. When the sun shines it turns, using the energy from the sunlight. It'ss quite a conversation piece and suits my propensity for enjoying gadgets. She looked at the globe as it was turning yesterday and said "There's a really good song that would go with a circling globe." I couldn't think of one but I did think of a good Bible verse which would be John 3:16! In yesterday's message "Educated Into Imbecility" we considered man's rejection of God and the resulting foolishness. This message may have been a bit distressing or even depressing to some readers. So today let's once again remind ourselves that His truth continues to march on. Jesus Himself said, "The gates of hell shall not prevail against My church." One year during a missions convention in New England I used a large, inflatable world globe to illustrate the work of Christ's Gospel being spread all over the world. We tossed the large globe throughout the congregation sort of like a beach ball, although it was much larger than that. There might be several of our readers from New England who would remember that particular mission's service over 20 years ago! I have always liked maps and globes. Now I enjoy sites like Google Earth! I try to imagine the people living in various parts of the world and the continued impact of the Gospel even in the hardest to reach places, both spiritually and geographically speaking. I have also found this useful as a prayer guide. The statement made in the daily text, by the Apostle Paul to the early believers at Colossae, illustrates the rapid spread of the Gospel in the first century. In fact it had extended into every quarter of the Roman Empire within three decades of Pentecost when the book of Colossians was written. However, this is not just a statement from history but a present tense description of God's work around the world. Today, "all over the world this gospel is bearing fruit and growing". Members of our spiritual family are spreading the Gospel and planting spiritual seeds all over the world. We are citizens of many different countries and there is a sense of national pride that most all of us experience. But all who accept Jesus Christ as their Savior have an infinitely greater citizenship. Paul, writing from a prison to believers in the Roman colony of Philippi, declares a citizenship we all share and rejoice in today, "But our citizenship is in heaven" (Philippians 3:20). Although he found his Roman citizenship a helpful defense in a time of trial, undoubtedly he considered his heavenly citizenship of incomparably greater value. And so should we! How Paul rejoiced as he wrote the daily text. Indeed "all over the world this gospel is bearing fruit and growing". Paul didn't just focus on those he had direct fellowship with as is evidenced throughout his many writings. He had a spiritual interest in all of God's creation, local or distant, that the gospel would bear fruit and grow in their lives. We, too, need to broaden our circle and embrace those of other nationalities, skin color, and culture. We should pray earnestly for those whom we may never meet on this side but will spend all eternity with as we worship the One and only true God. As we do so the gospel will be bearing fruit and growing in our lives today! Daily prayer: Father, we join with the apostle Paul as we repeat his prayer for our brothers and sisters....Since the day we heard about you, our brothers and sisters in the faith, we have not stopped praying for you and asking God to fill you with the knowledge of His will through all spiritual wisdom and understanding. And we pray this in order that you may live a life worthy of the Lord and may please Him in every way: bearing fruit in every good work, growing in the knowledge of God, being strengthened with all power according to His glorious might so that you may have great endurance and patience, and joyfully giving thanks to the Father, who has qualified you to share in the inheritance of the saints in the kingdom of light. For he has rescued us from the dominion of darkness and brought us into the kingdom of the Son he loves, in whom we have redemption, the forgiveness of sins. Prayer from Colossians 1:9-13: A prayer suitable for each of us to pray for our brothers and sisters in the faith. 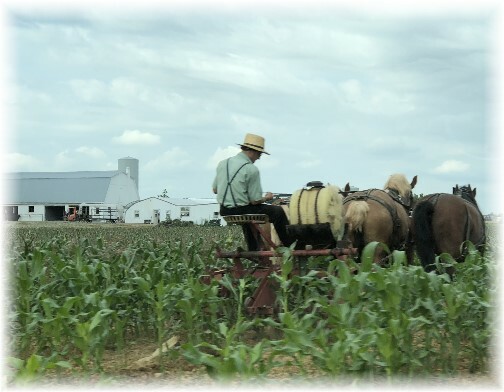 Many farmers are very busy with their field work.